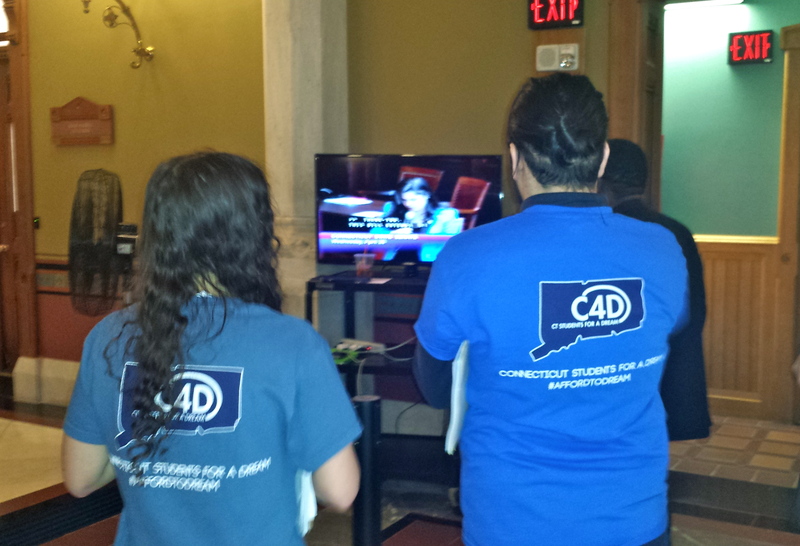 CT Students 4 a Dream members watch the state Senate debate on making undocumented students eligible for financial aid. Karina Baltazar says she can’t afford to go to college. She doesn’t qualify for financial aid even though her mother has been paying property, sales and gas taxes in the state for the last 18 years. Baltazar is an undocumented immigrant. Baltazer is not alone. Hundreds of undocumented youths and their friends testified that the $4,200 annual price tag to attend a community college and $18,000 to attend the University of Connecticut has put college out of reach. But after a 90-minute debate Wednesday, the state Senate voted 21 to 13 along mostly partisan lines to approve a bill that would make undocumented immigrants eligible to compete for a $140 million pool of financial aid beginning with the next school year. “To be turned away because they don’t have access to financial aid, it’s just plain wrong,” said Sen. Mae Flexer, D-Killingly. Republicans, however, said they foresaw some legal residents being crowded out of the financial aid pool if undocumented students were given access. “It’s going to cost them more money to go to college because the pool is going to be shared,” said Sen. Heri Martin, R-Bristol. The Senate approved a similar bill last year but the House failed to bring it up for a vote. This year’s legislation has the support of House Speaker J. Brendan Sharkey, and proponents of the bill who met with him last week say they are confident it will pass the House. While Gov. Dannel P. Malloy has not weighed in on this year’s legislation, he proposed last year that the state spend $450,000 to help undocumented students pay for college. A series of changes have been made over the last five years to help lower college costs for undocumented students. In 2011, state law was changed so that undocumented students who attended all four years of high school in Connecticut qualified for the much lower in-state tuition rates at public colleges. Last year the law was changed to lower the requirement to two years of high school. Just under 100 students currently benefit from these lower tuition rates at UConn. Sen. Paul Doyle of Wethersfield was the only Democrat to join Republicans in voting against the bill. Sen. Clark Chapin of New Milford was the only Republican to vote for the legislation. Two senators missed the vote; Sen. Kevin Kelly, R-Stratford, and Sen. Art Linares, R-Westbrook. Six states — California, Minnesota, New Mexico, Oregon, Texas and Washington — have changed their laws to allow undocumented students to receive state financial aid, according to the National Conference of State Legislatures. The state’s public colleges currently set aside at least 15 percent of tuition dollars each year to provide needy students with financial aid. The aid pool totaled about $140 million last year, non-partisan legislative analysts reported. Tuition paid by undocumented students currently contributes to that pool, though they are not eligible for aid. Republicans argued against that redistribution. Sen. Kevin Witkos, R-Canton, said it was unfair to ask students who are legal residents to pay 5 or 6 percent more next year so that part of that can pay for college for those here illegally. Last year, however, he and several other Republican legislators supported the bill, when it was approved by the Higher Education Committee. “We keep handing out money that we don’t have,” said Sen. Mark McLachlan, R-Danbury, on the Senate floor. Financial aid is not provided to everyone who requests it. The state-funded Governor’s Scholarship Program, which is not opened to undocumented students by the Senate-passed bill, provided aid to 11,328 students last fiscal year. But more than 20,000 students who were eligible did not receive a scholarship, reports the legislature’s non-partisan Office of Fiscal Analysis. In the state’s largest public college system — which includes the dozen community colleges and four regional Connecticut state universities governed by the Board of Regents — 3,879 students did not receive the aid they requested last school year. Regardless, the legislation has the support officials at UConn and the Board of Regents. 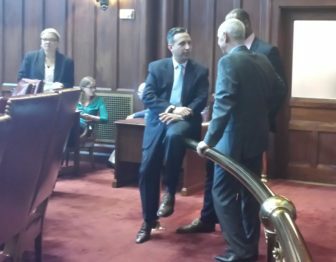 Regents President Mark Ojakian, right, talks with Sen. Bob Duff, Senate majority leader, left, and a member of Gov. Dannel P. Malloy’s staff before the debate on making undocumented students eligible for financial aid. Questioning about whether federal laws prohibit such aid was somewhat silenced last year when Connecticut Attorney General George Jepsen testified that legislators could allow financial assistance by changing state law. “Although federal law permits states to offer undocumented students certain forms of state-funded financial assistance, to do so states must first enact state laws authorizing students to seek and receive financial aid,” said Jepsen, who supported the change. It’s unclear how many children would benefit by opening the institution-funded financial aid, though legislators said they have been told it could be anywhere from 200 to 1,000 students. Last year, the budget chief for the regents system estimated that as many as 2,600 undocumented students could seek assistance from the regional Connecticut state universities and community colleges. Assuming half attend community college full-time and receive full scholarships, Erika Steiner estimates the cost at $9.7 million a year. But, she stressed, her numbers were high-end estimates that could be adjusted based on actual demand. Camilla Bortolleto, the policy director of CT Students for a Dream, said while watching the debate on TV outside the Senate chamber Wednesday that she expects the cost to be minimal.